Greece is a highly recommendable place for history lovers, sports enthusiasts and those who love to chill at comfy and luxurious villas. 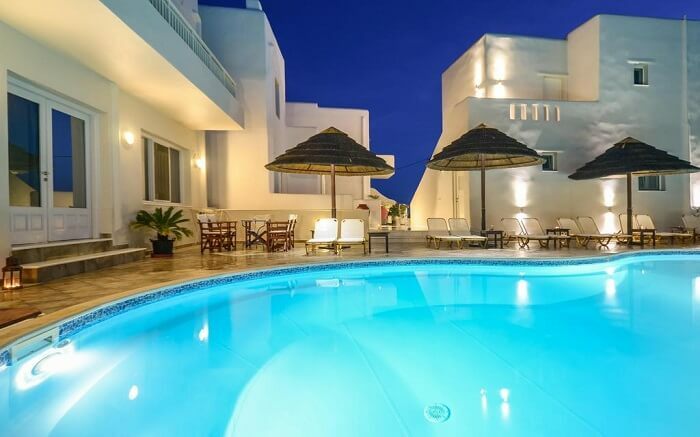 If you are looking for some gorgeous and the most luxurious Greek island villas that will envelop you by style and romance, this is the one you need. The level of serenity that it offers is unbeatable. And if you are looking for a spot to chill, there is small private cove where you can also enjoy the clear waters. Not everybody can afford it, but if you can, you must experience a stay here. With a vivacious and huge interior coupled with superb furnishings and modern décor, Ferretti villa stands unique in its offerings. One of the best villas in Greece, the detailed upholstery and infrastructure of it is supreme in nature. What’s icing on the cake is its stone-paved verandas which also houses splendid dining spots and open-sky lounge. Suggested Read: Greece In December: A Guide To Explore The Gem Of Aegean Sea During Winters! Perfectly situated at the northern coast of Corfu, this villa has lavished offerings set in the outskirts of Kassiopi village. 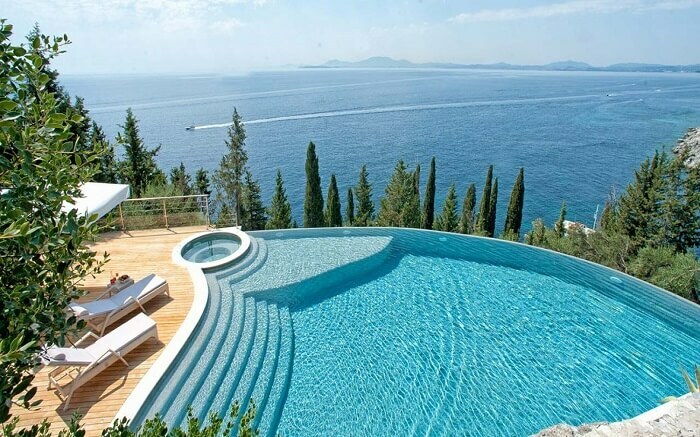 One of the luxury villas in Greece, it also offers superb lounging spots that further give amazing views. 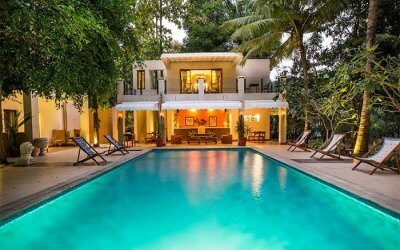 Indulge in this superbly-built villa and experience a lavish relaxation moment with your friends or family. Must Read: Things To Do In Greece For An Epic Mediterranean Vacation! Those planning their villa holidays in Greece, Vogue is the place for them. 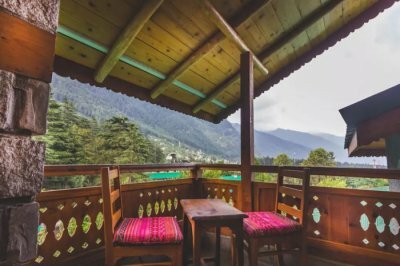 Here you can delve into a relaxing nature-covered vibe, and there is ample space which will give you superb outdoor entertainment. 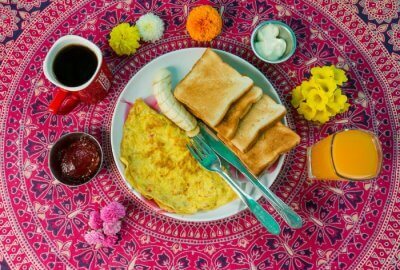 The luxurious services make this villa an outstanding place to stay during vacations. The interior, the outdoor, the amenities, all the high-end. 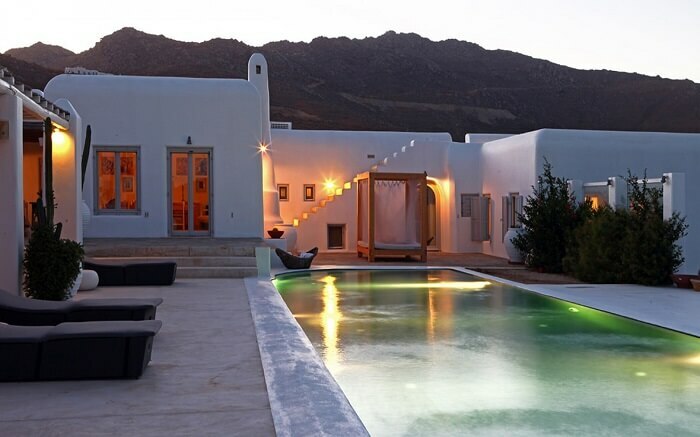 Popular as one of the luxury villas in Greece, Gadot villa reflects a blend of simplicity and opulence. It houses two buildings in nexus and gorgeous swimming pools equipped with sun loungers. Chill at this house of splendour with beautifully-constructed dining areas coupled with a bar and a barbeque area as well. 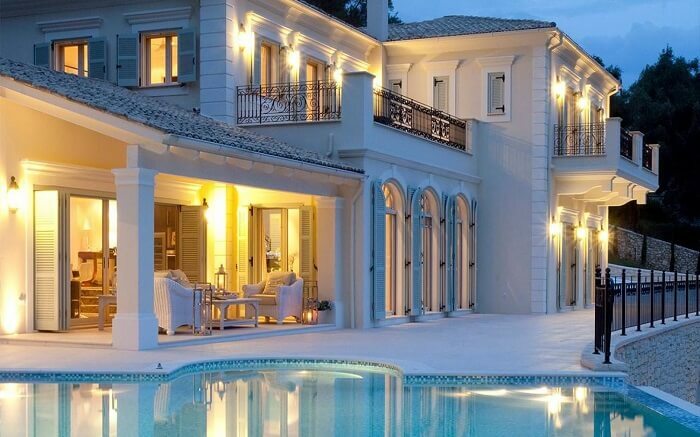 Looking for some luxurious villas to rent in Greece? Perfectly built in the village of Agios Stefanos, Daniela is a luxurious property that offers fully modern architecture and services. It also has comfy terraces that give a great flavour to the outdoor living. All the space inside this extraordinary property will take you on a journey in itself, including a blend of peace, serenity and beauty. Situated at Aleomandra, Oscar is among the finest villas in Greece with private pool near beach. 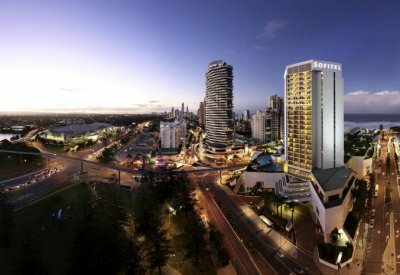 It offers unbelievable panoramic sea views and best-in-class ambience. The grey-blue wooden furnishings are something to die for. Adding to its charm is sophisticatedly designed outdoor living areas awash with the breathtaking gardens. One of the best Greek Island villas, it also houses a grand living room wherein you can have a great gaming atmosphere and a perfect place to watch movies in a 5.1 Dolby home cinema system. Those looking for villas in Greece with private pool near the beach, Greyhound can be your saviour. This beautiful property boasts of its classy VIP facilities, unobstructed panoramic views, top-notch amenities and utter luxury; all make this villa a place of top-level extravagance. 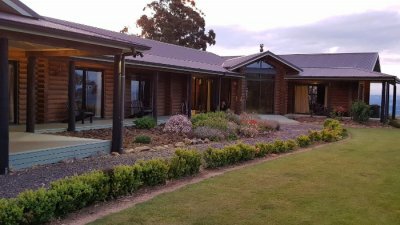 It has two floors and has the capacity of hosting up to ten guests. What makes it a heaven-looking piece is the large infinity pool set outside the property. Surrounded with lush environs and century-old olive trees, Olivia is among the best and cheap villas in Greece. The villa is well-known for offering unique panoramic views enveloped by ultra-modern services and unforgettable furniture. The villa has a collection of different sized blocks married with terrific terraces. It also provides an amazing lounge and huge dining areas which creates a special atmosphere in the villa. Looking for villas in Greece on the beach? Nothing could be a better choice than Pacino. Situated very close to one of the island’s top beaches called Panormos, this villa offers a brilliant family retreat awash with an awesome island vibe to chill. 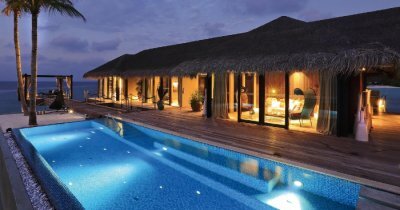 It also houses a wonderful infinity pool, overwhelming dining area and comfy lounging spots. 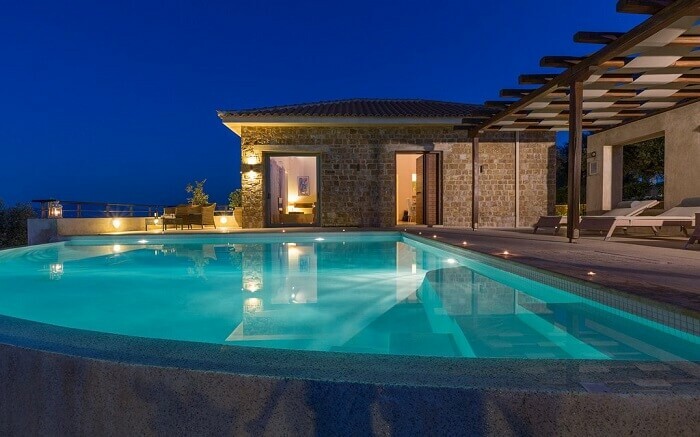 Which are the best holiday villas in Athens, Greece? B Residence in Glyfada, Apartment Nina in Athens, and Villa Politia are some of the best holiday villas in Greece. Are there beachfront villas in Greece? Yes, there are plenty. You can book your stay in Belvedere Beachfront Villa, Paradisso Beach Villas, and Azure Beach Villas to enjoy oceanfront views. Which are the best villas in Parga, Greece? Apolis Villas, Villa Angelika, Villa Corallu are some of the best villas in Parga, Greece. Exploring Greece while being absorbed in these relaxing villas is one of the best experiences you will ever have. So, what are you waiting for? Get your backpacks or get your bag packed, and revel in the charisma of Greece; it will be a blast! Further Read: Santorini Honeymoon Is The Romantic Escape Newlyweds Dream Of!